The Bhagavad Gita is a sacred Hindu scripture that has been a text of spiritual learning for a many years. The Gita is essentially a conversation between Arjuna, the Pandava prince, and Krishna, his powerful guide and charioteer. The Bhagavad Gita is one of the largest selling ancient Hindu texts even today. It gives us knowledge of the five important truths that we should know of. These are: Krishna, the individual soul, the material world, action in this world and time. While translating the Gita, A. C. Bhaktivedanta Swami Prabhupada has retained the actual meaning that was intended by Lord Krishna. Reading this translation of the Gita could be a way of attaining spiritual fulfillment and self-improvement. 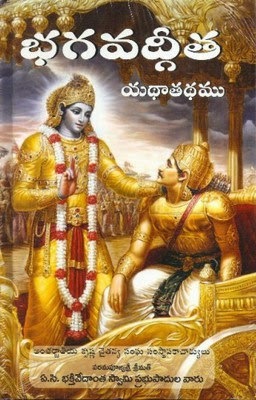 The Bhagavad Gita is a narration of the dialogue between Arjuna and Krishna. Just moments before Arjuna is about to enter the battlefield, he experiences a flood of thoughts that leave him with interesting questions about why he must fight and what could be the meaning of life. He also wonders what is going to happen to him after death and where he would go. Krishna answers all his questions and helps Arjuna attain spiritual enlightenment. Reading this version of the Gita will help us understand how we can follow the same path of enlightenment too. Abhay Charanaravinda Bhaktivedanta Swami Prabhupada was a Gaudiya Vaishnava guru and the Founder-Acharya of the Hare Krishna Movement. His mission has reached the entire world and his teachings are followed by millions of people.